On January 10th, the Council of Ministers approved the classification of the Perdigões Archaeological Complex as a Site of National Interest / National Monument. Located on one of Esporão’s properties, at Herdade dos Perdigões in Reguengos de Monsaraz, this is one of the most important archaeological sites in Portugal. Since 1997, an extensive project led by ERA Arqueologia and supported by Esporão, has been developed to research, safeguard and recognize this heritage. 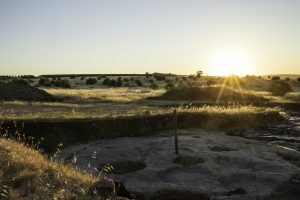 The Perdigões Archaeological Complex has gained recognition since 1996 when Esporão was faced with the involuntary discovery of an extraordinary archaeological site occupying more than 16 hectares, built and inhabited by various communities between around 3500 and 2000 B.C. From the ouset, Esporão asserted the will and responsibility for the discovery, to safeguard, protect and disseminate this heritage, committing not to plant vineyards in the area of the archaeological site and helping fund the scientific research. The Perdigões Archaeological Complex, located 5km from Herdade do Esporão, is an important prehistoric site dating back approximately 5500 years, including a megalithic sanctuary comprised of various menhirs, a vast set of cerimonial sites delineated by ditched enclosures, as well as several monuments and other funeral contexts containing the important and abundant remains of individuals buried here. Some of the most relevant pieces found during the digs are exhibited at the Esporão Tower, which houses the Perdigões Archaeological Complex Museum. Esporão has always maintained a great concern to preserve the historic heritage at Herdade do Esporão, creating the Perdigões Archaeological Complex, as well as restoring the Medieval Tower, Nossa Senhora dos Remédios Chapel and Esporão Arch. For those looking for an experience that involves nature and historic richness, the Wine Tourism at Herdade do Esporão offers a program with a tour of the vineyards to explore the latest sustainable planting techniques, combined with a hike and visit to the Historic Centre, where visitors can contemplate the essential elements of the collection discovered at the Perdigões archaeological complex. During the period when the archaeological digs are under way, visitors can also explore the site and accompany the work of the ERA archaeological team. They can also participate in special activities on Archaeology at Dia Grande (Big Day) – 5th edition 22/23 June 2019.